Ask fellow campers about "Asheville's Bear Creek RV Park & Campground" and nearby attractions. Don't know what the business owners would tell you but I can tell you that this is an absurdly tight and hilly campground. We struggled to get our 28 ft trailer in and even unhitched, we were still slightly in the very, very narrow an pot hole riddled road. Trust me on this, it won't work for you. Our site was level but backing into some of these sites can be a problem because of the sharp incline from the road to the site, I saw a couple of motorhomes drag their backend on the incline while backing in, this could be a problem with some longer wheel based mh, this park is for the most part big rig friendly...our services worked great and our site was long enough for the toad also....cell service ATT was good but their WIFI was ok until the park got full then it was non existent, their cable was good with lots of channels...the restrooms and showers were clean with lots of hot water, did not use laundry but it was clean and all machines appeared to be in working order....no ground fires are allowed, City ordinance, but you can use your fire pit if u have one like us.....the other main problem with this park is there is no where to hook up your toad when leaving, there is a short strip while leaving the park but you could be blocking outgoing campers and it's on a down hill slope which sometimes can be a problem....this park is close to everything including the Biltmore which is about 5 miles from the park, easy access from interstate....staff was friendly, but with all the choices to camp at in Asheville I would look somewhere else the next time, but I would return here if I had too....there can be a lot of traffic noise from the interstate that can/could be a problem for some of us... We camped at Asheville's Bear Creek RV Park & Campground in a Motorhome. Our site was difficult to get into without scraping our motor home on the asphalt. The site was all mud, no grass. Sites are extremely tight with our slide 6 feet from the RV next to us. Our outdoor chairs felt like they were in the neighbors living room. The picnic table was broken and filthy with sap. The office does not send email confirmations nor give receipts for payments. There are no hook up lanes thus often there are lines of RV's waiting to hook up on the narrow one way road out, tying up traffic for a long time. Even cars cannot get by. There is a lot of traffic noise from I-40. Don't waste your time or money at this campground. We camped at Asheville's Bear Creek RV Park & Campground in a Motorhome. I called and emailed to make a reservation, with no response to either. Finally, when it was time to park the RV, we decided just to see if there were any available spots. Office was empty, prior to 6:00pm, but there was an after hours board, so I went ahead and completed the form (and was honest about an extra person, so paid an extra $3 for the night). The spot was a pull through, but very tight, very close. Only one picnic table for every two spots (and ours was damaged). RIGHT on a busy road, headlights and traffic all night. In the morning, we left as early as we could since a car broke down during the night and was parked in front of us and our neighbor. At least we could back out of our pull through spot. Not sure what the neighbor did, as theirs was a back in spot. Pool was not clean. Didn't allow kids to swim even after walking up there. Needs attention... For the price we paid, we would have done better to stay a little further away. We camped at Asheville's Bear Creek RV Park & Campground in a Motorhome. Spots pretty tight, but location to local attractions more than makes up for it. Once backed in, site was more than adequate. Friendly staff. Great stay. Thank you. We camped at Asheville's Bear Creek RV Park & Campground in a Motorhome. In addition to our stay, we must advise all who read this, of an outstanding company we used while at the campgrounds. "It's all in the Finish" is an RV detailing company. The husband and wife team worked diligently, over a period of 2 days and did an extraordinary job washing and waxing (Teflon) our 9 year old motorhome. We couldn't have been happier with the results. Worth every penny. It depends what you are looking for as to how you will view this campground. It is on a narrow twisty road. If you have pull thru you would register and leave the camp to drive around again to get to your site. Pull thrus back up to the highway behind your rig and the main road in front of your rig. Back ins are on a narrow road up the hill once you have registered. This is not a problem if the campground is not full and everyone has not parked on the road. Most have to park cars/trucks across front of site. Some sites back in going up small hill. You can see marks in pavement where vehicles/trailers have bottomed out at the hitch. Did not use bathrooms, showers, or laundry. The location is great. Close to Biltmore, Bent Creek for mountain bikers, and close to Brevard, about 20 minute drive. May not be the best RV park but would return due to location. Once you get situated it is all good! Some sites have BIG holes in asphalt in where levelers have sunk in due to asphalt being so soft during summer months. Appears they have not tried to fill the holes. Over time this will be very problematic. As a result you have to be careful where you place your rig on the site. 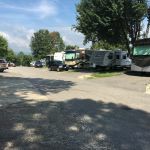 We camped at Asheville's Bear Creek RV Park & Campground in a Fifth Wheel. The mountain bike trails in Bent Creek are awsome! We arrived after 5 pm so office was closed. Park was very crowded and sites were carved out of every available flat area, as well as private residences and apartments. Our pull-through site was only a few feet from a busy road. Site was narrow and difficult to park due to tree and utility post. Decided that we could not put out slides so took an empty 30 amp spot that was wide enough for our slides. Restrooms were smallest that I have seen outside of a B motorhome: needed to keep elbow in when using stall or sink. Just not a comfortable situation. We camped at Asheville's Bear Creek RV Park & Campground in a Motorhome. We hadn't stopped here in several years, and it looks like no upgrades have taken place. After maneuvering winding road, you must turn into the campground on a sharp curve, then up a hill in front of office. Sites are all back-in up on the hill with uneven pads to get up on. All hookups are at the back. You must back up as far as you can, anyway, to get your tow off the narrow road. Clubhouse looks ancient, with old chairs in need of replacement or paint. Very little maintenance anywhere. No place to walk the dog, but we found a dog park two miles away. WiFi is good and location of park is good. We camped at Asheville's Bear Creek RV Park & Campground in a Motorhome. Biltmore Estate, Western North Carolina farmers market. A park that is hard to get to, older and not being maintained, and has enough of a waiting list that the office help is downright nasty. Showers/bath are clean, but watch out for the light timer; it's set for maybe 7 minutes and there's no warning; lights out as you have shampoo in your eyes! Two pull-through sites are impossible for motor homes with toads, but they'll put you in them despite asking for better sites. The concrete is cracked; deep ruts where coaches have had to go off the pavement just to get onto the pad. The worst part is Stink Bugs!! They infest the trees and get into your coach and it takes a year for them to all finally die. Bear Creek doesn't seem to do anything about them, because they started 2 years ago and got worse. If you want to go to Biltmore, then put up with their poor management, but use Google for Hendersonville or Flat Rock if you want level, clean sites with nice office staff. We camped at Asheville's Bear Creek RV Park & Campground in a Motorhome. Very close to your neighbors. Concrete pads. Barely room to park your vehicle. There's a picnic table but didn't use it because I felt I was eating next to my neighbors bedroom. We backed up to a beautiful view. Close to town. There's deluxe sites that are wider cost more. Office staff OK. We camped at Asheville's Bear Creek RV Park & Campground in a Fifth Wheel. Trolley ride from the visitor center. Blue Ridge Parkway ride. I can't say much about this CG's amenities, as we arrived late and left early, but I will say that you should DEFINITELY arrive during the daylight. The roads to the CG are very tight and twisty, as are the roads in the CG. Also, the lighting and signage is not very good at directing you where you need to go. It didn't help that it was dumping rain on us. We were also both fighting severe head colds. It was a bad night. The layout of this park is very strange. You have to drive up a steep incline to get the office. 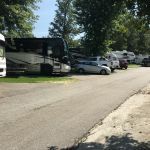 The road is barely wide enough for your RV, and if you don't have a back-in site up there, you have to exit the park, swing back around, and then go past the entrance to get to the pull-throughs. There was a sign for the pull-throughs, but no light guiding us into the drive way, and the road is a curvy disaster waiting to happen. It would definitely be easier in the daylight and without rain, but it's still tight. The park was nearly full, there are apartments on-site, and we witnessed two trailers stuffed into one pull-though next to us. Also, the back-in sites were very close together. Since we were literally under-the-weather, we asked for a late check-out time and were denied the request. We won't be back. We camped at Asheville's Bear Creek RV Park & Campground in a Fifth Wheel. Entrance to park rather confusing, site is pavement, level, full hook ups, pull through sites are right on the road in a curve so headlights shine in windows all night, freeway noise as it runs on two sides of campground. Price is very high for what you get. We camped at Asheville's Bear Creek RV Park & Campground in a Motorhome. 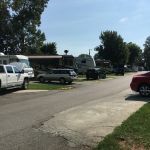 Worst RV park, private or chain we have ever stayed at! Bathrooms are deplorable, the pull-through site is so tight it is a chore to get into the site, internet is close to unusable, employee at the desk is not sociable or helpful, the park is old, crowed and unkempt. Site was within feet of a major highway with no barrier. I would not stay there again if it were free! We camped at Asheville's Bear Creek RV Park & Campground in a Motorhome. First, the good. Location is good. Convenient to Biltmore and downtown. Now, the bad. Very unfriendly front desk staff. Not at all helpful. Pull thru sites are tight with a lot, and I mean a lot, of road noise. Insufficient number of washers and dryers and the dryer I used took two cycles to dry one set of queen sheets. Large tree at our site had branches that scraped our roof. Neighboring site's pedestal was 2 feet from our front door. We camped at Asheville's Bear Creek RV Park & Campground in a Motorhome. Positive points - very convenient to I-40 and Asheville, and a level site with decent cable . That being said, we had to back UPHILL over a ledge (almost grounded the rig) to squeeze into a tiny site, backing into a dirt hill. Entire campground is on winding, very narrow roads, and there are trees on the sites that will scratch roof and sides of RVs. Rude clerk at check-in was rushing to pick up her child from daycare and told me to count sites to find ours - just waved in the general direction and handed me a map. Since we had requested a pull-through, we weren't happy to find out we didn't have one...had reserved over a month in advance. The sites are so tiny that we had to ask 2 neighbors to move their tow cars so we could pull out. (They arrived after we did). There isn't enough room for cars at the sites, so they were parked blocking us in. ( very kindly agreed to drive away so we could get out of our site). We think this is pretty outrageous. I took our trash to the fenced area, and was surprised to see trash bags outside the fence...until I got there and saw there were no barrels! Disgusting. I believe in never saying never...but have no plans to return here, nor do I recommend it. Better "camping" at Walmart! We camped at Asheville's Bear Creek RV Park & Campground in a Motorhome. My tip is to avoid this campground. Asheville is a great city - plenty to do here: the Biltmore area, River Arts Area, interesting downtown. The hop-on/hop-off trolley was a good way to get an overview. No shopping or restaurants close to the RV park, but plenty to chose from with a drive. The WNC Farmers Market is a mile or so from the park. Follow NC 191 south to Brevard and visit the Cradle of Forestry in Pisgah National Forest. It is worth the trip. Asheville has many good brew pubs in the area. We managed to get to about four. Wicked Week was the best of the four we visited. Of course there's the Biltmore... The cost made us hesitant at first...$60 per person, but the campground had a deal...2 days for $70, so we spent day 1 in the Biltmore and day 2 on the grounds. I think the entry fee and the high cost of trinkets, wine, hotels and food cover more than just the maintenance...but there is a lot to take care of. Signage is good, but make sure you ONLY enter at the main entrance when checking in. After getting site assignment, you might need to actually leave the park and re-enter to get to your site. Although the Biltmore Estate is quite pricey, it really is a magnificent place to see. If you order tickets online at least 7 days in advance, you get a $10 discount. Also, RV park sells tickets for same regular price as at the estate and you get the second day free. Blue Ridge Parkway main visitor center is close by and has a great movie and information. You could easily spend a week in Asheville. If the campground staff is unhelpful for you as they were for us, the local visitors' center will provide you with more than enough to do. It is extremely convenient to everything Asheville. Downtown Asheville on Friday nights is quite lively and fun. The drum circle in the downtown park was impressive. Great location to Ashville, Biltmore House, and the Farmers Market. We didn't care for the food at Moose Café at all! Too bad because it is so convenient. We went to Biltmore one day, very easy to get on I40 East to get there. Went to Hendersonville one day, very easy to get to I26 East to get there. Cecil's Tavern at the Biltmore estate was a great place for lunch. There are several walking paths we enjoyed at Biltmore as well as bike trails there and along the rivers in downtown Asheville. The Biltmore and shopping are minutes away! Apollo Flame restaurant is really good and relatively close. We are at Moose Cafe a couple of times. Breakfast was great but lunch was just OK. Get there early because it's a very busy place with little space for lines. Head out to Swannanoa (on rt. 70) to Okiedokies Smoke House for some really good BBQ. Its not far from the KOA Asheville East CG. Brunswick Stew was awesome. Asheville had lots of shopping and of course the Biltmore. We did a trolley tour and thoroughly enjoyed it. Also access to the Blue Ridge Parkway very convenient. Asheville is a tourist town with lots for visitors. Asheville is a very dog friendly town. Lots of places to eat with a patio. We took the Big Purple Bus tour around the town. It was a great way to see the sights and be entertained. The mountains are beautiful. Very convenient to the Blue Ridge Parkway. The Biltmore is very close. Luella's BBQ, Bent Creek Park, Blue Ridge Parkway and the Biltmore tour were some of the highlights. Moose Café less than a mile away is a good one. Are you affiliated with Asheville's Bear Creek RV Park & Campground ?